VB thought Harper was a boy! 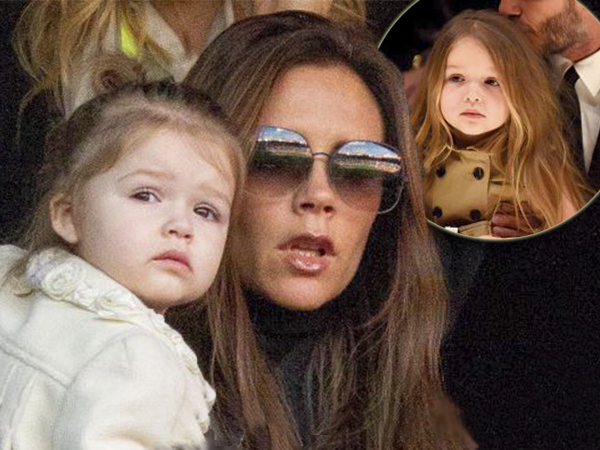 Victoria Beckham was initially told her daughter Harper was a boy. The 41-year-old fashion designer and her former football star spouse David are parents to four children, Brooklyn (16) Romeo (12) Cruz, ten, and three-year-old Harper. The pair were thrilled when they found out they were having their fourth child, and despite speculation they wanted a little girl Victoria insists they would have been happy either way. Victoria is intensely proud of her brood, not least because they are so grounded. She explained they only thing they have been spoiled with is love, with Brooklyn working for the last two-and-a-half years in a cafe. The children are all really close too, which could go some way to explaining some of Harper's pastimes. Victoria famously started her career as a singer in the Spice Girls, something she will never cringe about as she had so much fun. Now she can't believe she has been accepted in the fashion world, and she's still astounded when she thinks about the turn her life has taken. Victoria also poked fun at the assumption she's moody, and at how she's morphed over the years. She's previously admitted being embarrassed when her father used to drive her into school in a Rolls-Royce, something she now can't fathom. "How times have changed because I would much rather go in a Rolls-Royce now – for sure," she deadpanned. After insisting nothing was off limits during the talk, Victoria also spoke about her husband. She met David when she was in the Spice Girls and he was playing for the Manchester United team and they will celebrate their 16th wedding anniversary next month. Looking back, she can't believe how over-the-top she was with him when they were first together.